Our generation is fast becoming the master of the social media campaign. From the Ice Bucket Challenge to the 22 push up nominations, we’re all experts in supporting causes with the simplest acts of solidarity that can really make a difference. The latest in social media philanthropy is Polished Man; a campaign that raises awareness of the growing epidemic of violence against young people, while encouraging men everywhere to embrace all the great traits of masculinity this October. Zac Efron took to Instagram, proudly flaunting a one-fingered manicure with this very important mission: To provide trauma relief and prevention to those children around the world at risk of violence. Happy to paint one nail and be a @PolishedMan this month to say no to violence against children. 1 in 5 children are subject to physical and/or sexual violence before the age of 18 and that’s one too many. James Marsden was nominated by Efron – the pair a friends after starring in 2007’s Hairspray together – and got himself a man-icure too. 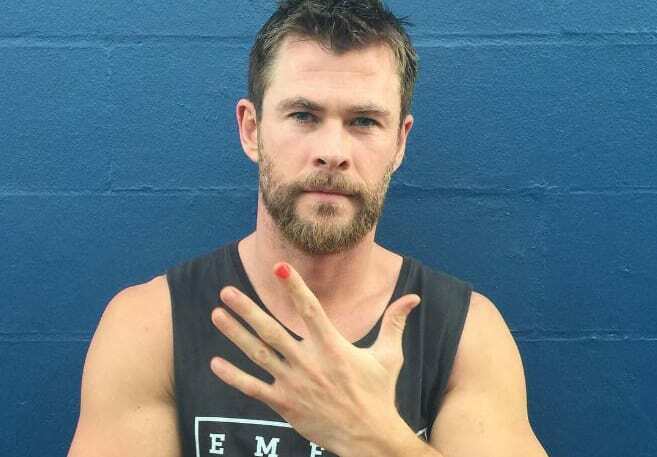 Brothers Chris and Liam Hemsworth got in on the act, nominating each other and sharing their painted nails. The Polished Man campaign has so far raised nearly $600,000 (£493,450). Support from these popular actors, who’s characters embody many of the masculine ideals society unjustly expects from men, will undoubtedly bolster the campaign. Gabriel Macht of Suits fame usually looks polished and suave on screen, but he took things to new levels when he came out in support of the Polished Man campaign with a gothic-inspired black look. But it’s not just actors that are getting into the role. Riptide singer, Vance Joy sported a DIY, scruffy-round-the-edges kind of nail polish to champion the cause. NFL Superstar, James Anderson is also helping to redefine traditional masculinity through this simple act of painting one of his finger nails. Anderson is joined by nearly 8,000 men on Instagram who have used the hashtag to further the growing awareness of violence against children. A serious-looking Kelly Slater – otherwise known as one of the greatest surfers of all time – has put his pinky up for the campaign. Slater – and all his fellow polished men – are right to take this campaign seriously. Happy to have been nominated by @Liamhemsworth to be a @polishedman and bring awareness and support to a beyond worthy cause. 1 in 5 children are subjected to physical or sexual abuse before the age of 18 with 90% of that abuse coming at the hands of men. Over $500,000 has been raised for the cause and two weeks remain. All funds raised through Polished Man are channelled into trauma recovery and trauma prevention programs for children who have suffered or are at risk of suffering violence globally. I nominate @mfanno, @pmtenore, and @john_john_florence to join me and @ygap in raising awareness and painting a nail for a month better than I do. Polishedman.com for more details. Social media campaigns like these have received a lot of hate, with critics claiming participants are only engaging with the issues on a shallow, superficial level. However, the Polished Man campaign has been gaining momentum since 2015 – a slow burner in comparison to some of the Facebook nominations and quick-fixes we’ve seen in the past. Long may this campaign continue to receive support from celebrities and from those of us who can lend our help by donating whatever we can for this just cause, or simply painting one finger nail to start a discussion which could change children’s lives.